As state-level legalization of cannabis spreads across the United States, employers in the cannabis industry have rapidly expanded hiring even in the face of legal risks at the federal level. 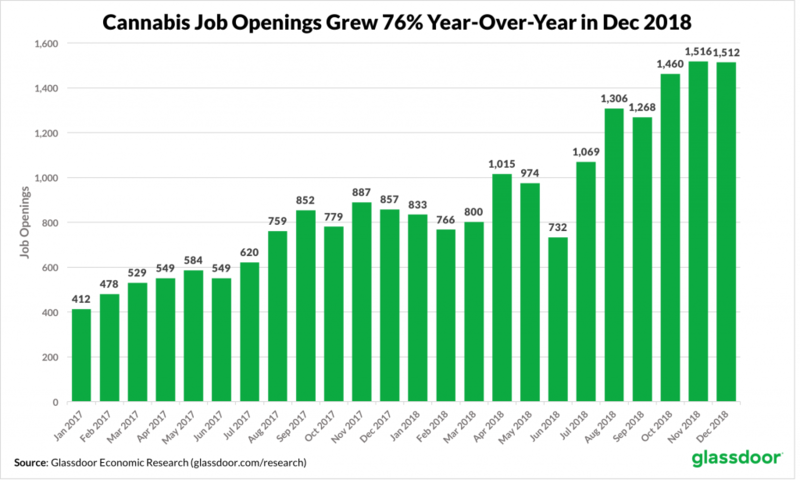 Cannabis job openings are increasing rapidly. Using Glassdoor’s database of millions of job openings, we found 1,512 cannabis industry job openings in the U.S. in December 2018, a 76 percent increase over the same period in the previous year. Cannabis jobs pay higher than U.S. median salary. The median salary for cannabis industry job openings is $58,511 per year. This is $5,648, or 10.7 percent, higher than the U.S. median salary of $52,863, according to Glassdoor’s December 2018 Local Pay Report. 53% of cannabis job openings are for professional and technical workers. Market trends are driving increased demand for a wide variety of skills and backgrounds from marketing to plant sciences to accounting. It was a banner year for the cannabis industry in 2018. Canada officially legalized cannabis and many are looking to the United States for signs that it will follow suit. In fact, seven states and Washington D.C. approved measures in 2018 to loosen restrictions on cannabis, bringing the number of states with legalized recreational or medical marijuana up to 33 (and D.C.). Support for national legalization has reached a record high with 66 percent of Americans now in favor, according to an October 2018 Gallup poll. Despite growing popular sentiment favoring cannabis, the industry’s legal status remains tenuous at the federal level. However, there’s another force at play that’s much stronger than public polling and political prognostication: businesses and employers. Investment in hiring is one of the strongest indicators for business confidence as it requires a substantial long-term investment of time, effort and money. In this analysis, we consider the state of the job market for the cannabis industry. How many jobs are available today? Which employers are hiring today, in what U.S. cities and how much pay do they offer? As the industry grows, how will increasing regulatory scrutiny and business opportunities shape its needs for talent? Glassdoor’s dataset of millions of job postings and salaries grants a unique view of how the growing cannabis industry’s job market is evolving. This analysis is based on a large sample of online U.S. job postings from Glassdoor. To evaluate the state of the cannabis job market, we performed a text search of Glassdoor’s real-time job openings database for any job posting containing cannabis-related keywords. We excluded any jobs that refer to drug testing or substance use to ensure we were accurately measuring industry-related job openings. 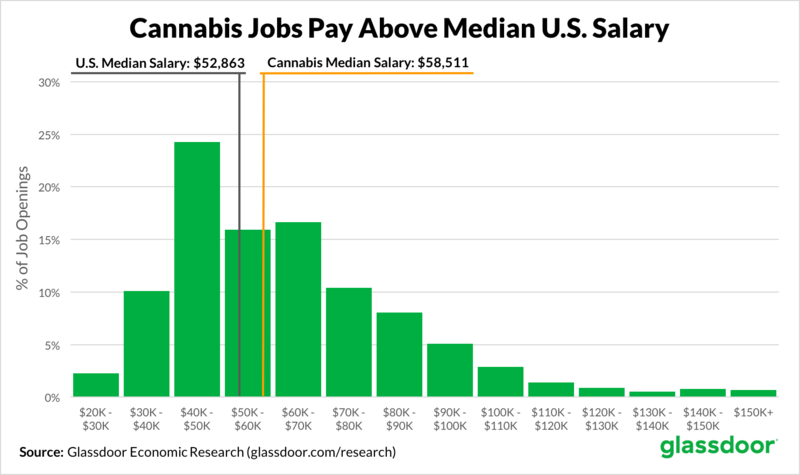 We then used the technology behind Glassdoor’s “Know Your Worth” tool to estimate the median base pay for each job, providing a comprehensive picture of pay and open jobs in the cannabis industry. How Many Cannabis Job Openings Are There? Cannabis jobs are growing rapidly in the United States. As of December 2018, we found 1,512 cannabis-related job openings in the United States on Glassdoor. By comparison, in December 2017, there were only 857 similar job listings, representing a 76 percent year-over-year increase. Jobs in the cannabis industry are centered in larger cannabis-friendly cities where workers and customers are readily available and legal protections offers growth opportunities. The top three metro areas for cannabis job openings are San Francisco, CA with 197 open jobs (13 percent of total U.S. job openings), Los Angeles, CA with 181 open jobs (12 percent) and Denver, CO with 99 open jobs (7 percent). The top cities benefit from being located in states that were early adopters in legalizing cannabis—California, for example, has 7 of the top 15 metros. On top of that, their well-known liberal culture and diverse, high-skill workforce make them ideal cities for a budding cannabis industry. While most of these jobs are concentrated in the top 15 cities, the remaining 39 percent are distributed across the rest of the country. It’s much more dispersed than in nascent high-technology fields, where job openings are much more geographically concentrated to access talent with uncommon and highly-specialized skills. Artificial intelligence sees only 13 percent of jobs outside the top 15 metro areas, and blockchain only 21 percent. The wider geographic distribution of cannabis jobs reflects the need to be physically co-located with customers and the greater accessibility of the industry to a wide variety of American workers. What Roles Are In Demand? Cannabis industry roles on Glassdoor are highly diverse, requiring an array of skills and backgrounds from marketing and retail to research and agriculture. The jobs available, however, broadly fit into three categories: service and retail, professional and technical, and labor and physical. The most in-demand occupations are in service and retail—brand ambassador and sales associate, each accounting for 5 percent of open jobs. Other similar jobs include store manager (3 percent), wellness coordinator (2 percent) and budtender (1 percent) that lean heavily on communication skills and customer interaction. Many of these jobs require knowledge and skills unique to the cannabis industry. For example, budtenders may mix skills from jobs such as bartenders or sales associates with a unique knowledge of cannabis products. Similarly, store or dispensary managers often combine ordinary store manager duties with an understanding of their unique products and local cannabis laws. The variety of service roles also speaks to the novelty of the industry with the accompanying needs to overcome customer unfamiliarity and create a positive image. Secondly, while professional and technical roles don’t appear very high on the list below, they actually comprise the majority of open jobs at 53 percent. This discrepancy is due to the variety of professional and technical jobs available, ranging from audit assurance manager (2 percent) to product manager (1 percent) to marketing manager (1 percent). As the cannabis industry becomes more legitimate, more and more professional roles will be in demand to help businesses comply with tax laws and regulations and scale into larger markets. Roles open for labor or physical work include delivery driver (2 percent), security guard (1 percent) and packer (1 percent). These roles don’t generally require specific knowledge of the cannabis industry nor higher education, and there are many of these roles available due to the physical nature of the industry—plants have to be grown, products have to be processed and goods have to be transported. Small to medium businesses make up the majority of employers hiring in the cannabis industry, including the top-hiring employer, Green Thumb Industries with 67 job openings. Green Thumb Industries and many other top-hiring employers like Surterra Wellness (58 openings), MedMen (31 openings) and Vireo Health (31 openings) are vertically-integrated businesses that cultivate, process and sell cannabis-related products directly. Other employers come from a number of adjacent industries. 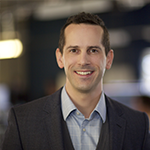 For example, PAX Labs (52 openings) is best known as the inventor of the JUUL e-cigarette, Eaze (43 openings) is a cannabis delivery service and Weedmaps (29 openings) provides online reviews for cannabis businesses. There are several employers specializing in legal and regulatory services. The need for workers with professional services and regulatory expertise will only grow as the industry becomes more legitimate. MGO (41 openings) is a professional services firm with a unit specializing in cannabis and the State of Washington (22 openings) is expanding its regulatory and compliance workforce to enforce laws regarding the nascent industry. Notably absent from the list are large employers. Small to medium businesses with less than 500 employees account for 84 percent of job openings. This is likely due to the tenuous legal standing of cannabis discouraging larger businesses from investing as well as the highly localized nature of the cannabis market. How Much Do Cannabis Jobs Pay? Using the technology behind Glassdoor’s Know Your Worth tool, we can assign a salary estimate to open cannabis jobs. Overall, we found a median base salary of $58,511 per year for open cannabis industry jobs on Glassdoor. That’s $5,648 (10.7 percent) higher than the U.S. median salary of $52,943 per year, according to Glassdoor’s December 2018 Local Pay Report. Due to the diverse mixture of jobs available, salaries range from $22,326 per year all the way up to $215,384 per year with service jobs on the lower end of the spectrum and medical and legal professionals near the top. Legitimization: As the industry legitimizes and new regulatory regimes arise, more workers will be required to ensure compliance with state law, accounting standards and product safety requirements. This is reflected in the growing demand for accounting and professional services as well as hiring for regulation and compliance by state governments. Professionalization: With investment pouring in and more small and medium businesses popping up, demand is increasing for professional and technical workers who can manage and scale businesses. Workers with higher education and skills in fields as varied as marketing, horticulture and logistics will only be more desirable as the industry grows. Modernization: The tech boom is tagging along for the ride with online platforms for retail, reviews and delivery sprouting up alongside the cannabis industry. These employers will require even more professional and technical workers to develop and grow their technology-focused businesses. The cannabis industry in the U.S. faces myriad risks in the future with uncertainty over its legal status and uneven state-level regulations. However, by increasing hiring and investing in human capital, employers are signaling their confidence in the long-term staying power of the cannabis industry.